The train operates a currency exchange and Tax Free refund point. Rubles, dollars and euros are accepted. An audioguide informs the passengers about the sights and historical events along the train route. In 2017, the year of the 100th anniversary of Finland's independence, the train presented a small library that introduces passengers to the classical and modern literature of Finland. Capacity: 2 persons. Facilities: 2 berths, a folding table. 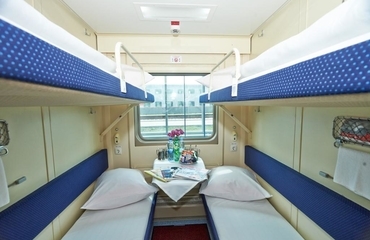 Carriage: 8-10 compartments, a/c, bio toilets. The train got its name in honor of the famous Russian writer, the author of “War and Peace” novel. The birthday of the train "Lev Tolstoi" is on May 30, 1975. 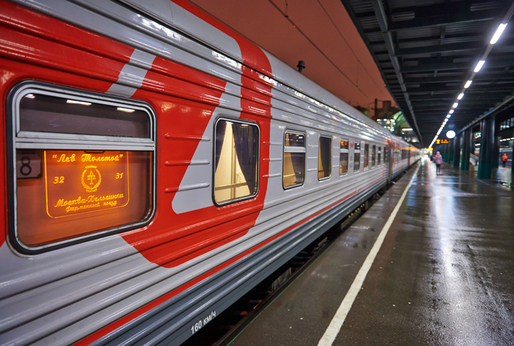 It was the first night train, developing speed over 120 km / h. And although there are now faster trains going to Helsinki, "Lev Tolstoi" is still in great demand by people who value comfort. It runs daily from the Leningradsky Station in Moscow through Tver, St. Petersburg, Vyborg, Vainikkalu, Kouvola and Lahti to Helsinki and back. The ordinary train composition consists of 5 first-class carriages, 8 second-class carriages, 1 or 2 luxury cars, a restaurant car and a car-carrier. In the train "Leo Tolstoy" you will feel comfortable and safe: the train is guarded by a special brigade, and the doors in the compartment have electronic locks. All the train conductors have very high qualifications, long work experience and know several foreign languages. The restaurant car is richly decorated in Russian style and offers to enjoy the Russian cuisine and special athmosphere. 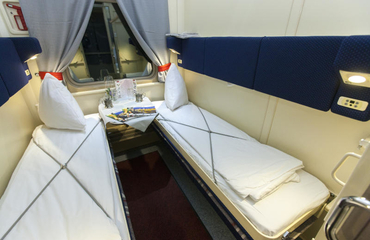 In the cars of the first and second class there are eight sleeping compartments. In the 1st class compartment there are two lower berths, in the 2nd class compartment there are two lower and two upper berths. Each car has two sanitary units (in one of them there is a shower). The places for luggage are located below the lower shelves. Each compartment has an individual air conditioning system, two sockets, shelves for storage of small items, individual lighting for each seat. A washbasin is hidden under the folding table of each compartment. In daytime the lower shelves are transferred into comfortable sofas with a soft back. In the middle of the back, there is a folding armrest with cup holders, so that the sofa easily turns to two comfortable chairs. And at night, these sofas are just as easy to turn into beds with a width of 70 cm, already dressed with bed linen. In the first-class carriages they provide superior bed linen, extra pillows and terry towels. Hot meals are provided for the passengers in the first class. The luxury carriage consists of 4 compartments and a bar. The compartment can accommodate up to 2 adults and a child. The coupe in the luxury car is transformed into a bedroom, a living room or a study. The sofa is transformed into a double bed, and there is also an upper sleeping shelf. All the compartments are equipped with private air conditioning, DVD players, LCD TVs, Internet access. For maximum comfort in the compartment there are individual shower cabins and a biotoilet with a heated floor. A shower set, a bathrobe and slippers are provided for each passenger of a luxury car.